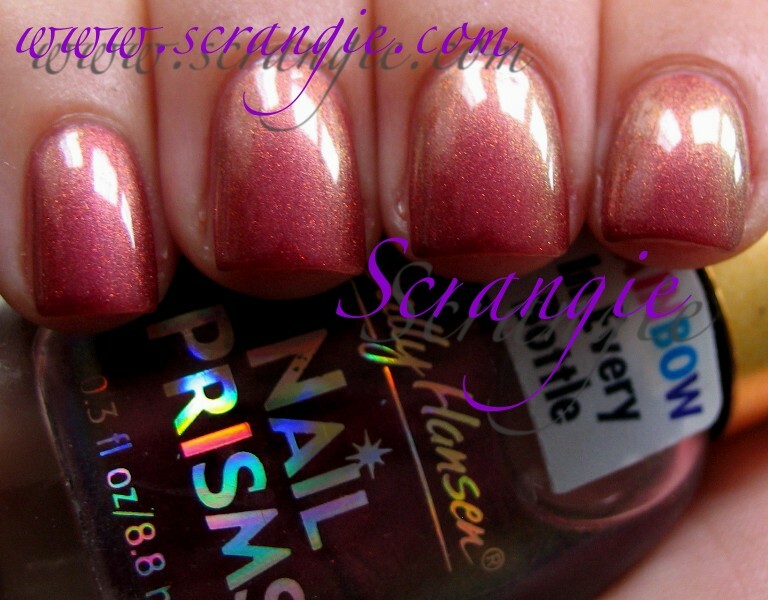 Been a while since I posted a Sally Hansen Nail Prisms swatch, but that Lipstick Queen Monarch lipstick reminded me of them. This is one that I don't see mentioned as often as the others, and it may not be as dramatic of a duochrome as Turquoise Opal or Amber Ruby, it is special in its own way. Sally Hansen Nail Prisms #39 Lilac Aqua. I can see lilac... but not really sure where the aqua in the name comes from. 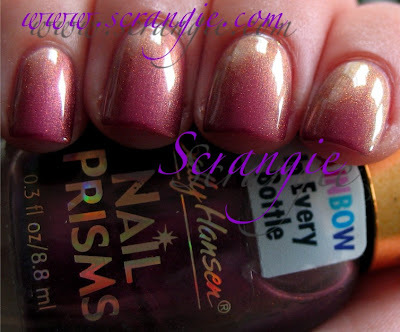 It's a shimmery mauve/rose pink base with multiple flashes of color. It shifts between purple with orange-coral, yellow-gold and green. 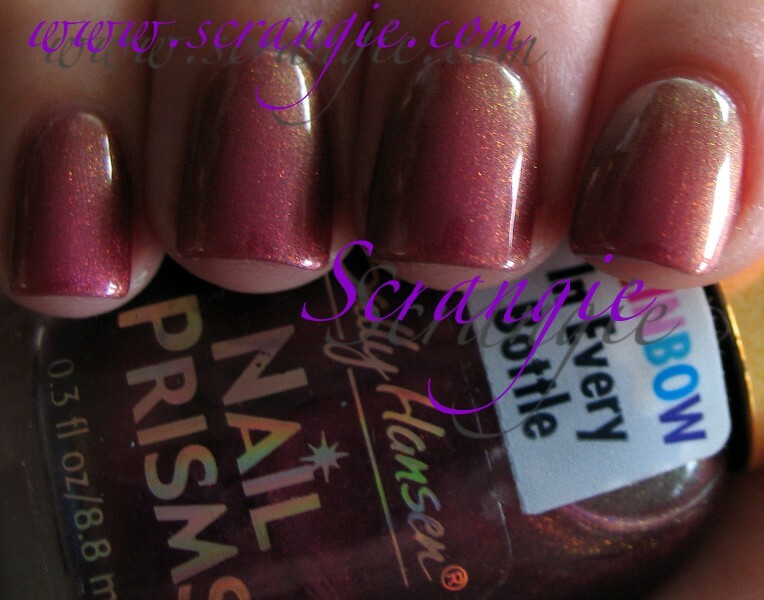 What I like most about this color is the shimmer. If you look closely (click on that third picture to enlarge it), you'll see that it has those tiny, bright red-green shifting shimmer particles that are also in another one of my favorite polishes: Clarins 230. This picture was four coats. 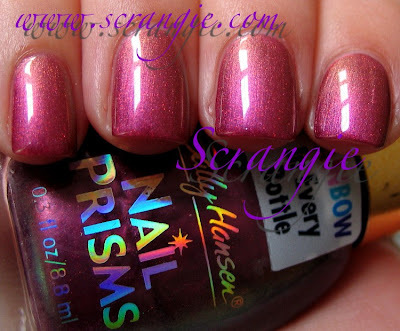 So, Lilac Aqua... Maybe not my favorite Nail Prisms shade, but still has a special place in my duochrome sparkles-loving heart. Oooh, this is pretty. I agree, not as duochrome-y as other Nail Prisms but it's still a nice polish. Lovely colour, reminds me a little of OPI's Ruble for your thoughts, a little less orange and a little more pink though. Awesome swatch as always. Beautiful! I love the color-shift! It's purely beautiful. I am so sorry I did not pick up a ton of these when they were being sold. So pretty! I love the different colors in the light. 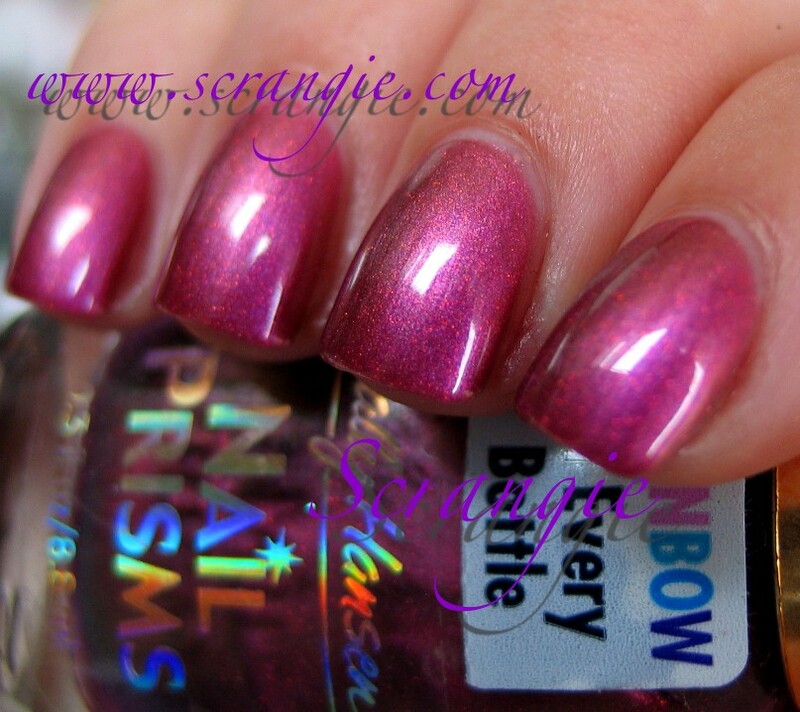 I don't think I've ever seen Nail Prisms for sale before. Are they discontinued? Is it a regional thing? Thanks. I would love to have them all! Wish we had a Ross here in PR, for the most part people have found a couple of shades.. 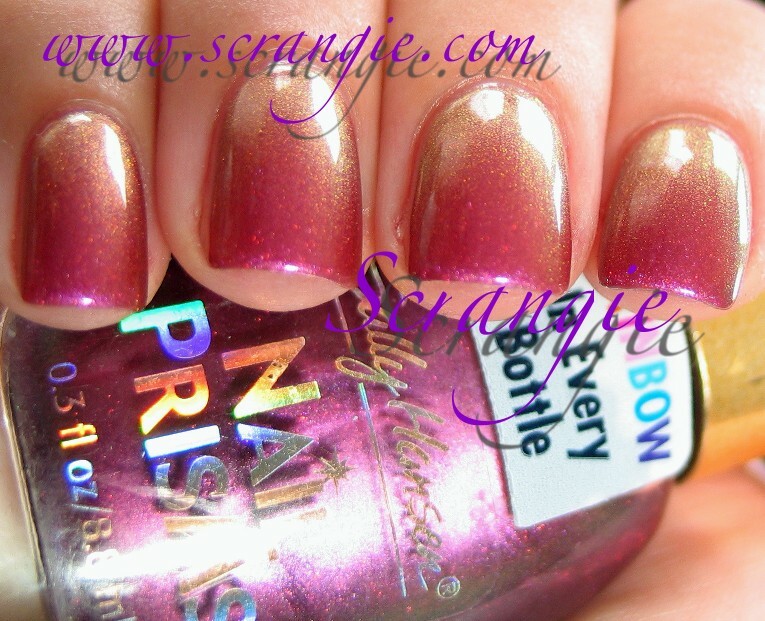 I LOVE this polish, and haven't been able to get my hands on it. 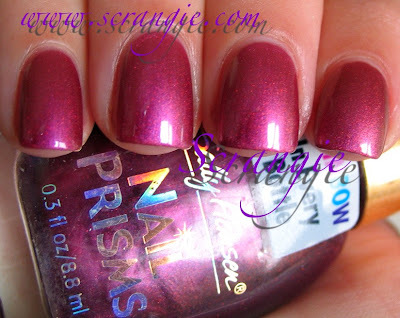 Have you ever tried it on top of a dark violet or black? You get a beautiful poor man's unicorn pee. Pony pee. Wow is this one ever gorgeous! I might need to see if I can hunt this down on ebay. I have zero! Found one at this old warehouse, but back then I was foolish and put it back because I wasn't sure if it was real or not. but even if I go back, the bin was full of probably thousands of polishes, so it'll be next to impossible to find...haha! I like how you included lots of photos of this. :) It gives me a better feel for the colour. Pretty nails! This is really pretty. 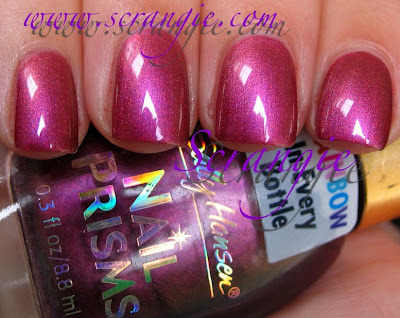 I have a few Nail Prisms but not this one. I had a bunch of these a long time ago when I was in high school, and I got rid of them because I stopped polishing my nails for several years. Waaaa! Such a bad decision. Fabulous! I don't think I have this one. It's subtle and very pretty. Man, worst decision ever discontinuing these. I have to find these, this one is so pretty. I have to find these, this one is very pretty.